Corydalis is an herb native to the northern hemisphere and the high mountains of tropical eastern Africa. In the herbal world, it’s a powerhouse pain reliever. It contains compounds that provide natural pain and inflammation relief without any addictive side effects. It also promotes relaxation and may serve as a remedy for stomach ulcers (x). So how can corydalis benefit your health? Dopamine is a neurotransmitter that plays a role in our ability to think, remember and move. It’s also integral to the development of chronic pain (x). Corydalis acts as a prominent dopamine receptor blocker that relieves and then eliminates pain. Plus, unlike conventional drugs, it does not lose its effectiveness over time. So how exactly does corydalis stop pain in its tracks? It contains a compound called THP, or tetrahydropalmatine (try saying that five times fast! ), which interacts with dopamine to reduce sensations of pain (x). A number of studies suggest corydalis could help alleviate moderate chronic pain (x). Additional research has proven that its pain-relieving and sedative effects could also combat pain that may not respond well to conventional medications (x). 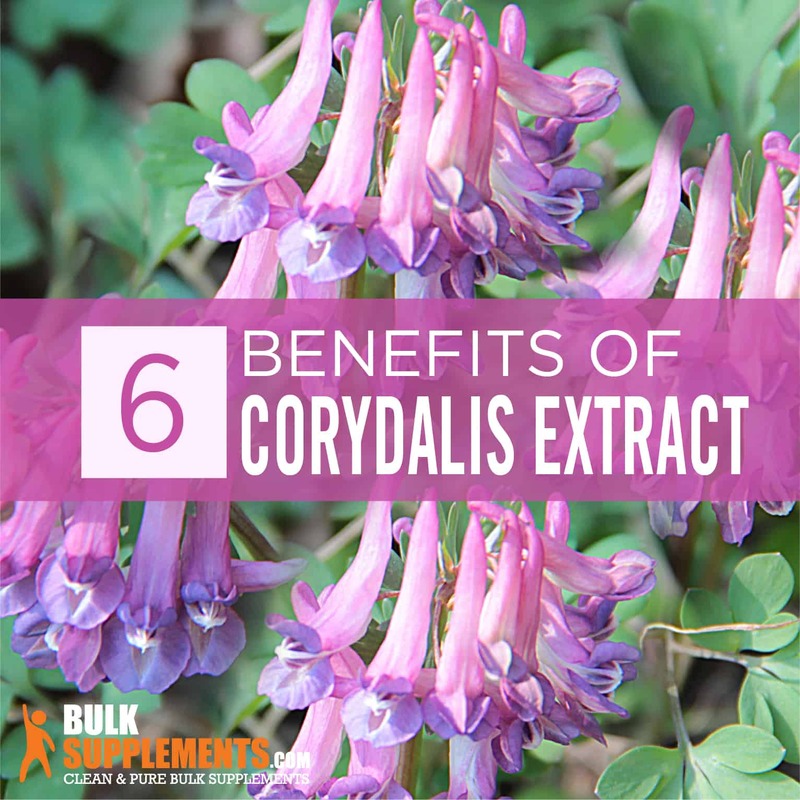 Because it interacts with your nervous system to promote feelings of calmness, corydalis could help relieve insomnia without the possibility of becoming habit-forming like many over-the-counter sleeping pills (x)(x). Corydalis’ pain-relieving properties are especially useful to those with disorders of the digestive system. Corydalis extract may help treat stomach ulcers and pain caused by ulcers (x). It has even been shown to calm stomach spasms associated with conditions like irritable bowel syndrome (IBS). Protecting your body from inflammation reduces your risk of developing chronic diseases like cancer and cardiovascular problems. Corydalis is a natural anti-inflammatory agent, and can also help you avoid the potential side effects of high doses of medications used to treat chronic pain (many of which lead to harmful inflammation) (x) . Some studies suggest corydalis contains compounds that benefit heart health. Research indicates it may improve abnormal heart rhythms and lower high blood pressure (x)(x). And since it promotes feelings of calmness and relaxation, it may also help alleviate the strain that stress puts on your heart. If you suffer from particularly debilitating premenstrual syndrome (PMS) symptoms, corydalis may be able to help. Research shows that the THP found in the herb eases cramping and pain associated with PMS (x). In one study that examined herbs used to treat PMS in Chinese herbal medicine, corydalis was shown to be one of the most effective PMS remedies (x). 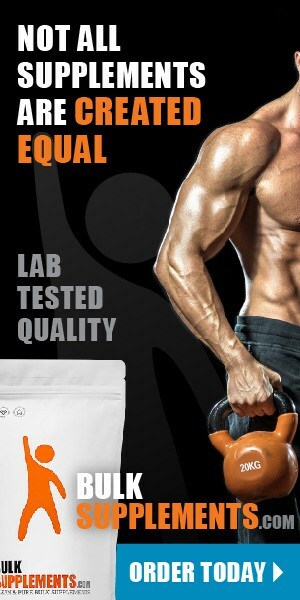 Use caution when taking this supplement. In excessive amounts, it may lead to muscle tremors and spasms. Don’t take corydalis if you take sedatives, cancer medications, or anti-arrhythmic drugs, as it could interact with these medications. Women who are pregnant or nursing should not take corydalis. Speak to your doctor before taking this supplement if you have a history of heart problems. You can find corydalis as a whole herb, as a liquid extract, or sold in a softgel capsule. Pure corydalis extract powder is one of the best ways to take this herb, since it contains a greater concentration of the herb’s active, pain-relieving ingredients. As a dietary supplement, take 1000 mg (scant 1/2 tsp) daily, or as directed by your physician. 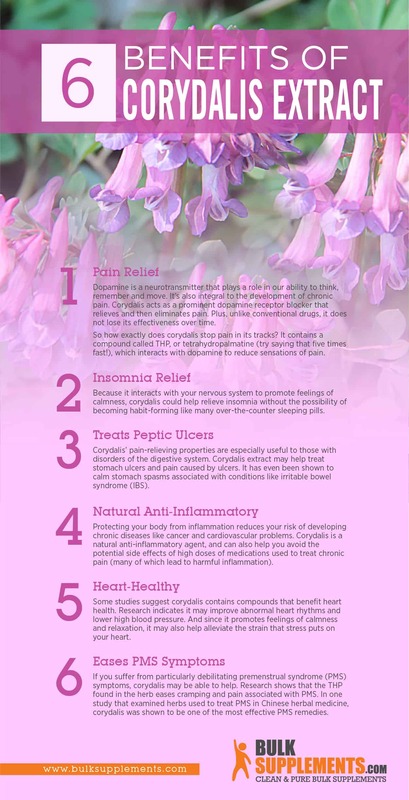 Unlike many over-the-counter pain relievers, corydalis provides natural, herbal pain relief without the risk of addiction. It benefits everything from your heart to your digestive system, and can even help you get a good night’s sleep.